Call it bipartisanship, call it a coincidence. (Or hey, maybe it was a Breast Cancer Awareness Month thing.) But at Tuesday night's second presidential debate, Michelle Obama and Ann Romney wore nearly identical outfits. Hot pink, or Schiaparelli pink as you fashion hounds might call it, was apparently the color of the night. 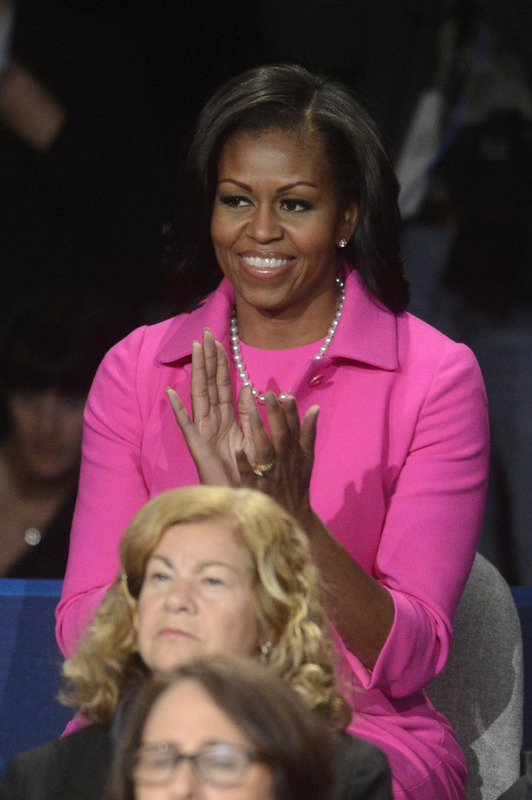 For her hubby's big night, Michelle was wearing a hot pink dress with a coordinating jacket. (We're thinking it might be Preen, like FLOTUS' last debate outfit, but we're just spitballing here Nope! Turns out it was Michael Kors.) It wasn't too surprising to see Mrs O. in pink -- the color worked wonders for her at the Democratic Nation Convention and she's sported the plenty of times before. But Ann must have also had the same idea, wearing a short-sleeve dress by Oscar de la Renta in a nearly identical shade of Pepto pink. Ann's textured dress was a new one for her, by far the brightest thing we've ever seen her in (save for that bird shirt). She upped the vibrancy with an aqua statement necklace, plus a blush-colored, brocade print shawl seen before the debate began. Given the rather stunning coincidence in Ann and Michelle's fashion choices, we feel obligated to ask: who wore it better?